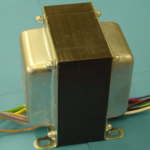 Output transformer for HiFi World amplifier designed by Andy Grove. 30W at 20 Hz. 10 Hz to 80 kHz bandwidth bifilar wound. 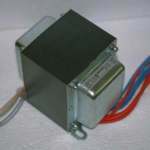 Primary Inductance 150 mH. DC resistance 0.75 Ohms. Primary dc standing current 2.0 A max. . Suitable for 4 or 8 Ohm speakers. Size "N". Weight 4.9 Kg. 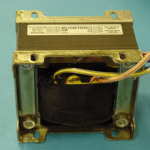 Output transformer for upgrade or replacement of Soldano overdrive lead guitar amp. Exceptional harmonic response achieved by winding technique developed jointly by Dr N Partridge and Dr G A V Sowter. 2200 Ohms primary. Secondary oprions. Bandwidth 20 Hz to 100 KHZ. Overload point 100W at 50 Hz. Size "N". Weight 4.9 Kg. 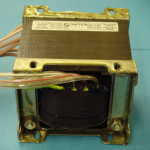 Output transformer for upgrade or replacement for Marshall DSL-50. Fully balanced multi section winding gives improved bandwidth and low frequency performance. Greatly improved harmonic response. 6000 Ohms to 16/8/4 Ohms or other secondary configuration options. 50W at 50 Hz 150 mA. Size "K". Drop-through style "T" fits original chassis with minor modification. Other package options. Package style Open frame style "O"Fully shrouded style "S"Drop through style "T"
350 V at 400 mA. 120 V at 50 mA. 6.3 V CT at 4.0 A, 6.3 V CT at 4.0 A, 6.3 v at 2.0 A. Worldwide primary 120,110,100 V ( twin windings) Size P. Style optional. 350-0-350 V at 250 mA. 6.3 V CT at 4.0 A, 6.3 V CT at 4.0 A, 5 V at 2A. EU Primary Size P. Style optional. 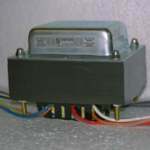 For Dynaco Output transformers see UA21 and U070.